Moms do more than pass on their genes to their daughters. They have a powerful influence as role models for their daughters’ physical activity, dieting behaviors, body image and self-esteem, according to a panel of experts at the Role Modeling Health Legacy Summit, hosted by the National Milk Mustache got milk?® Campaign and Family Circle magazine. Physical Activity: “Mothers can also play a positive role in influencing their daughters’ activity level – both by explicit modeling of behavior and logistical or tangible support, such as providing transportation to activities,” said panel member and pediatrician Alanna Levine, MD. Providing this support may be especially important for young girls who do not perceive themselves as being athletic. Dieting Behaviors: Mothers may unknowingly pass on poor body image and weight worries to their daughters. Studies have found that weight-related issues of parents, particularly mothers, are transmitted to their children. Body Image and Self Esteem: Research shows that early awareness of body weight is associated with a low self-worth in girls as young as 5 years of age. Concerns about weight can affect a child’s self-esteem and wellbeing. Adolescent girls who perceive that their mother is frequently trying to lose weight are more likely to be preoccupied with weight themselves and more likely to become constant dieters. With awareness, knowledge and skills, mothers can pass on a new legacy of healthier food and beverage choices, body relationships and increased physical activity. Eat (and Drink) Healthy Yourself. Kids will do as you do, so consume the foods and beverages that you want your children to have. Encourage lowfat or fat free milk instead of sugary drinks at every meal. Make Meals Matter: Make family meals a positive time for you and your kids. Avoid criticism and enjoy your time (and your food) with your family. Get Active: Be active to set a good example for your kids. Avoid unhealthy habits and find your family’s favorite ways to be active together. Focus on the Positive: Avoid making negative comments about food, your body or your child’s body. Boost your daughter’s self-esteem by complimenting qualities beyond just appearance. 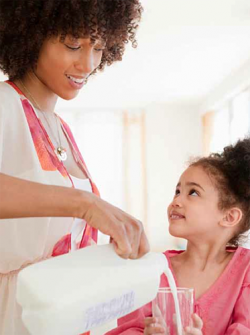 For more information on role modeling healthy behaviors, the full research in “Like Mother, Like Daughter: Exploring the Crucial Link Between Mothers, Daughters, Food and Health,” and more, visit www.Facebook.com/MilkMustache or www.whymilk.com.